Proposals currently being considered to enhance transparency in the FX market risk disadvantaging LPs further, and could impact market liquidity. All participants would certainly benefit from firm liquidity, priced accordingly, with customers assured of fair execution. Customers need to accept that wider spreads, or increased commission fees, is the price that must be paid for firm liquidity and transparent price discovery. Transparency for transparency’s sake is not a sustainable path, and the very real concerns of market makers regarding liquidity in a more open market deserve both to be recognised and addressed. Having stated that LPs need to be rewarded, the report then goes on to show how the explosive growth of non-banks in the market, and the rapid advance of new technology, have created pressure on the traditional OTC market structure and legacy trading practices that can no longer be ignored. The only question is how far and how fast the industry is prepared to go. Will the over-the-counter (OTC) trading model continue to dominate an industry which is increasingly subject to demands for greater accountability and certainty of execution? Can the modern technology introduced by recently emerged FX venues enhance transparency in the FX market? 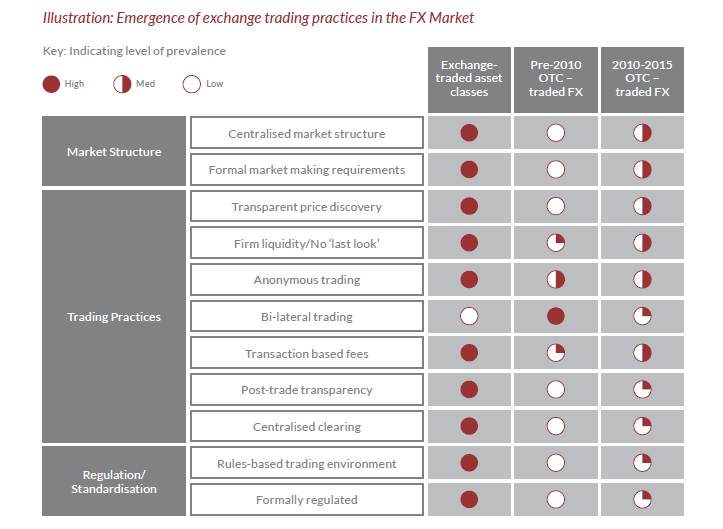 To what extent can regulation and standardisation of FX market practices improve fairness? The report then builds the case that fairness and transparency can best be provided by an exchange model….. There will certainly be advantages for large buyside firms to trading on an exchange model. Transparent central limit order book (CLOB), firm liquidity with no last look, no counterparty credit risk, and be required to post collateral and subject to variation margins, although they would be as they will be trading with the exchange as counterparty, but will gain from the margin against other exchange traded products. Although, many corporate clients would probably prefer relationship based trading with their banks, using credit lines rather than having to post collateral and be subject to variation margin. However, under new regulatory rules, the capital charges – such as credit value adjustments (CVA), for non-cleared OTC products will become more expensive. OTC client clearing, would mitigate much of the increased capital charge, whilst enabling banks to retain the bilateral trading relationships whilst mitigating counterparty risk by novating trades to the CCP on execution, which we explained in earlier post around client clearing and this study by Deloitte on incentives for central clearing).